The lovely dogwood tree (Cornus spp. ), a favorite in residential landscapes, adds structure and beauty to the garden. Its fresh blooms of white, pink and red are a sure sign that spring has come. Unfortunately, many dogwoods are susceptible to fungal diseases which mar their beauty and jeopardize their health. As common as fungal diseases are, there is a lot the gardener can do to prevent, treat and mitigate their effects on dogwoods. Dogwoods, though native to shady woodlands, are susceptible to fungus when planted in shade. Shade keeps leaves wet and protects dogwood fungi from the sun. Dogwoods, needing moist soil, are also vulnerable when allowed to suffer through drought without irrigation. The two most common dogwood diseases are powdery mildew and dogwood anthracnose. Powdery mildew appears as a gray powdery film on leaves. Rarely fatal, severe cases cause leaves to disfigure and drop. Dogwood anthracnose, the most serious dogwood fungal disease, is often fatal. It appears in spring as spots on both sides of leaves and bracts. Spots have tan or purple borders. If left untreated, anthracnose will kill leaves and branches. If dieback goes all the way to the trunk, it can kill the entire tree. Dogwoods should be planted in full sun in well-drained, moist soil. Air circulation is crucial to keeping leaves dry. Give the plant room to grow and keep it away from overhanging branches. Thin out crowded branches and those that cross each other. Keep dogwoods well-watered and properly (but not overly) fertilized for good health. Yank suckers out of the ground and rake and bag leaves and twigs as soon as they fall. Young trees that are affected with powdery mildew can be treated with a fungicidal spray containing triforine. Dogwoods with anthracnose can be sprayed with propiconazole or chlorothalonil when young. Chemical treatment of mature trees is not recommended for practical and economic reasons. Full chemical coverage of large trees in a controlled manner is difficult, and the need for periodic spraying (every 7 to 14 days) is expensive. Look for anthracnose-resistant selections. Korean dogwood (C. kousa), a late-spring bloomer, is resistant, as are the many hybrids between it and the North American native flowering dogwood (C. florida). Kousa varieties include 'Chinese', ‘Milky Way’, ‘Miss Satomi’, and ‘Galaxy’. 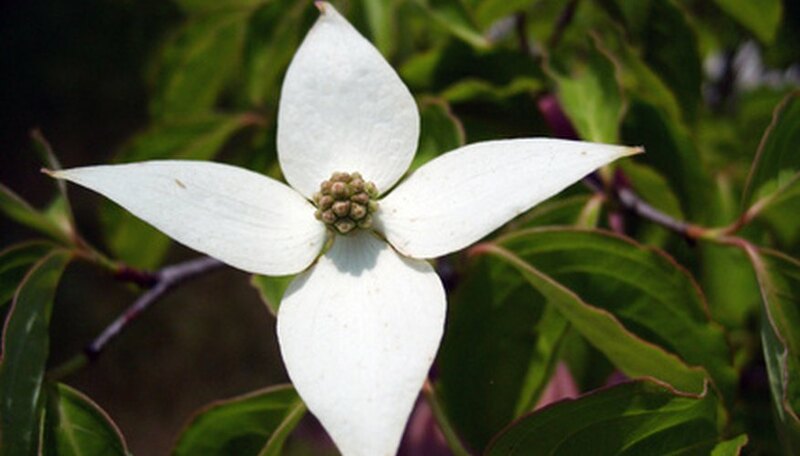 Resistant hybrids include ‘Constellation’ and ‘Stellar Pink.’ Flowering dogwood, the most susceptible species, is available in varieties that are less susceptible, but not entirely immune. Look for ‘Pink’, ‘Cherokee Brave’ and 'Sweet Water Red'. Other resistant dogwood species include pagoda (C.alternifolia), bigleaf (C. macrophylla), red osier (C. sericea) and tartanian (C. alba). Plants resistant to anthracnose are generally resistant to powdery mildew. How Tall Do Dogwood Trees Get?